In 1988 the dilapidated Holy Cross Convent was purchased by creative visionary and artist, Tina Banitska, and was later resurrected as the Convent Gallery and Cafe. Situated on the slopes of Wombat Hill overlooking Daylesford, the quirky gallery hosts both local and international artist exhibits in their eight individual galleries and has a cool gift shop that you’re bound to find something for every taste. The Bad Habits Cafe is bright and airy and if the weather is warm have a seat in the garden. The scones are straight out of the oven and onto my plate before they get a chance to cool down. I can taste the nutmeg and cinnamon in the big scones and they have a creamy fluffy texture. There’s enough of the raspberry jam and the double thick cream to be spread liberally, and I try to do the right thing by balancing it out with a Wellness Tea from the Tea Tonic range, after all it’s still breakfast time! Wander around the gardens, and if your visit coincides with the weekend, grab a drink in the Altar Bar. Saying that, sometimes they hold four to five weddings on the weekend, so check in case the bar is being used. It’s a jovial place to hang out and every one of the staff has big personalities that matche the building’s fascinating history and pizzazz brilliantly. Tea: A range of Tea Tonic loose-leaf teas. Overall: A quirky, fun, and ‘must-do’ stop on the itinerary. Thank goodness it’s only a hop, step and a jump to the Pavilion Cafe from the Hepburn Bathhouse & Spa, and I am seriously floating after my soak in the famous mineral waters and the deeply relaxing Vichy shower/scrub/body mask treatment. Built in 1908, the Pavilion Cafe is an Edwardian heritage-listed building and has an old worldly feel with its vaulted ceiling, tiled floor and huge stained glass windows. After having a healthy chicken quinoa salad I splurge on their famous Devonshire Teas, and try the energising Mother Earth tea that has spearmint, calendula, hibiscus and liquorice root. The scones are fluffy and fresh and are the perfect size. The double thick cream is as you would expect but the real winner here is the raspberry/strawberry/vanilla bean jam – slightly tart and just the way you’d expect house made jam to taste. It’s worth to buy a batch on your way out of the door. Make an afternoon of it and try the Bathing and Tea Package that offers Bathhouse entry and a Devonshire Tea in the Pavilion Cafe afterwards. Gluten free scones available. Tea: A range of teas, but try the loose-leaf Mother Earth Tea from the Hepburn Bathhouse Collection. Overall: The place to chill after taking the water at the adjacent Bathhouse. Tea: A small basic selection of loose-leaf teas. Peppermint and chamomile in teabags only. Overall: Be careful, you may end up developing a penchant for knitting. My day is filled with appointments to see the sights of the beautiful Daylesford area, so I am through the door of Sweet Decadence just after they open at 9.30am. The sign outside the chocolate shop announces that they have mineral water scones available, but when I place my order, the waitress isn’t sure and ventures in to the kitchen to ask – never a good sign. It’s Monday morning so I am expecting fresh steaming hot scones from the oven, but I’m sure the ones I get are yesterdays. I’ve never had ‘mineral water scones’ so I’m not sure what to expect, but these are dry, a shame as they have the potential for a top score. There are lashings of the wildberry jam, which is rich and slightly tart, rather than sickly sweet, and the accompanying double thick cream. I choose the Cleopatra tea – chamomile, rose petals and lavender – which is a lovely change with its subtle refreshing flavour. Definitely love the kettle teapot, but lose the coffee cup please! Tea: A decent variety of loose-leaf teas served in a funky looking kettle teapot. Overall: A decadent chocolate shop vibe. It’s either freezing cold in the Macedon Ranges or the place to be when Melbourne sizzles in the summer. Whatever the temperature, it’s a lovely place to visit with views of Macedon and beyond. Drop in to the Top of the Range Cafe to browse the bits ‘n’ bobs for sale before or after a pleasant stroll up to the Memorial Cross. When I visit, it’s cold outside and we are the first customers for the day. The big scones are impressive but unfortunately aren’t tasty. 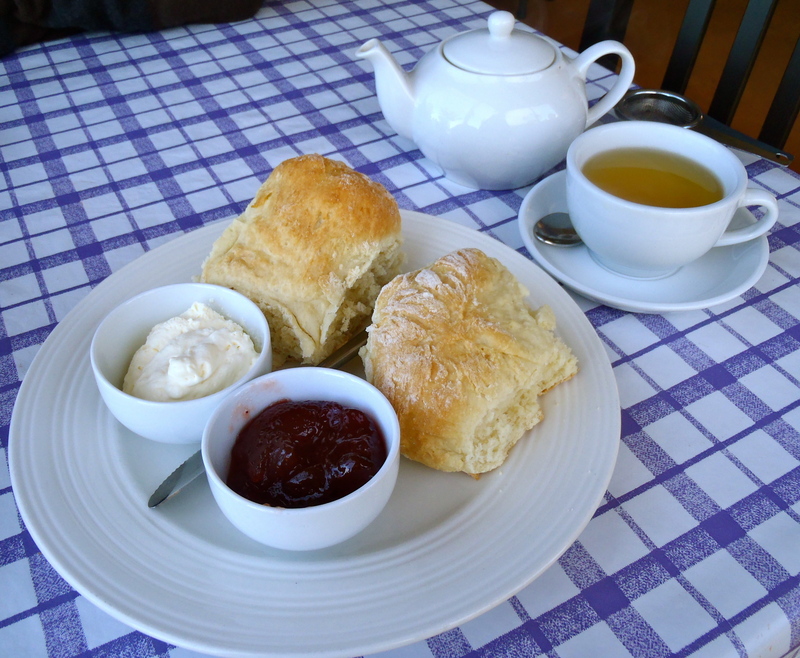 The good quality jam and thick cream gives it some credibility but you can’t make a bad scone good. Tea: A variety, including herbal and served in a big pot. Overall: A nice place to take a break especially if it’s cold outside.